This is a really fascinating video for anyone interested in the emergent complexities (and edge/corner-case failures) that inevitably arise when folks start fixing social problem with technology. It’s absolutely mandatory viewing for anyone who thinks they have a “simple” gun-control/gun-safety solution, especially one that involves “smart gun technology” (SPOILER ALERT: such solutions are not solutions at all). 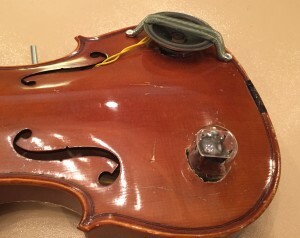 Just as an aside, it seems a little over-cautious for WIRED to call these “potentially dangerous flaws” in the gun’s design: The gun can be fired by an unauthorized person in possession of the firearm (using magnets available at any hardware store), and it can also be disabled at a distance by an attacker with some minor soldering skills. Both of these hacks require very little skill (and not even all that much money) to execute now that the flaw is known. As such, the gun fails at both things it’s supposed to do (i.e., work in an an emergency and prevent unauthorized folks from making it work). The existence of these flaws guarantees that large agencies (military, law enforcement, etc.) will never use these unreliable solutions, and thus the price won’t come down due to economies of scale. This smart gun is, at best, a novelty—and there is no reason to believe that any of the other early generation technologies will be any better until there is a fundamental change in how these are designed and engineered (e.g., the design needs to be open and companies need to start offering very high bounties for finding hacks, so that guys like the fella in the video have an incentive to buy these things as soon as they hit the market and start tearing them down). Annoyed that they glossed over spring reverb, a very portable mechanical reverb solution, but this is otherwise a great intro to the history and significance of reverb in music. This is a commercial/charitable fundraising situation. The Humble Bundle folks and No Starch Press have bundled together a bunch of awesome books. Pay as little as $1 to get a few, $8 to get a bunch, and $15 to get them all. If you go in at the $15 level, you get ~$300 in books (all digital, all in multiple formats, all totally DRM-free, so you can read them however and wherever you like). 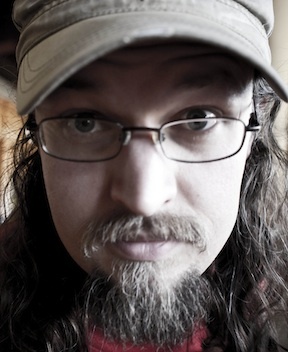 It’s a really awesome deal (I bought plenty of Humble Bundles way before I ever was part of one—and, I’ll be straight with you: Being part of one as an author is a really big boon for me, too; my last Humble Bundle put an additional 30,000 copies of my book in front of eager makers, and helped me make enough money to stay afloat that year). Even if you only drop a buck for the first five books, you’re getting some great stuff—Medieval LEGO is fun, the Scratch book is solid, and my son loved Lauren Ipsum (which is sort of a modern computer-science take on Phantom Tollbooth; he’s easily read it a half dozen times). Moving up to the $8 tier doesn’t just get you my book (which regularly sets you back ~$20), but also two of my favorite intro programming books (I learned Python from Teach Your Kids to Code, and Scratch Programming Playground is what taught my kid to code) and a really great manga book that’ll explain electricity to anyone. And, of course, going whole hog just piles on the awesomeness (again, I’m especially pleased to see a couple DIY hands-on electronics books here, especially since Arduino has gotten so dirt-cheap to get into). Every purchase doesn’t just benefit my publisher and me, but also Teach for America. Brussels, Arthur Lacomme. As you’ll recall he and his pals built some frikkin’ awesome! 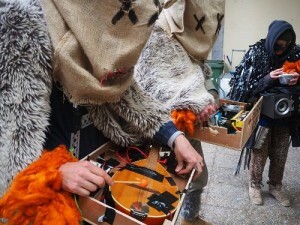 costumes/instruments/noisetoys for the Carnaval Sauvage de Bruxelles. You can see more pics and vid on Arthur’s website. I love a lot of things about both this Carnaval Sauvage de Bruxelles thang and Arthur’s contribution to it, bot most of all I love their costumes. 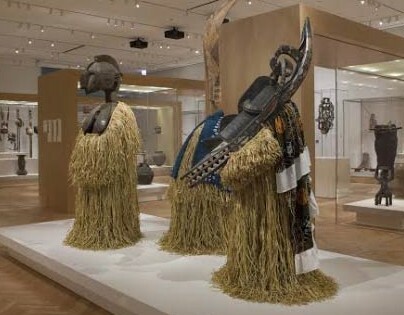 When I was very little my mother was a docent at the Detroit Institute of Arts, and so my earliest memories are of that museum, and especially their collections of Native American and African ritual art and “material culture.” I’ve always loved the dance costumes they have in their collection (similar to those shown below, which are in the AIC), and the dances that went with them, which were exuberant and otherworldly to me (much like the sounds that I like to dig out of unsuspecting electronics). Arthur also pointed me to a few of his fellow Brusselers (Brusselman? Brusselsprouts?) similarly pushing out into the fringes of the Good Noise. I’m loving this! PRO-TIP: Get both of these vids playing simultaneously in separate windows on your computer; the sounds layer-up in a fun way. 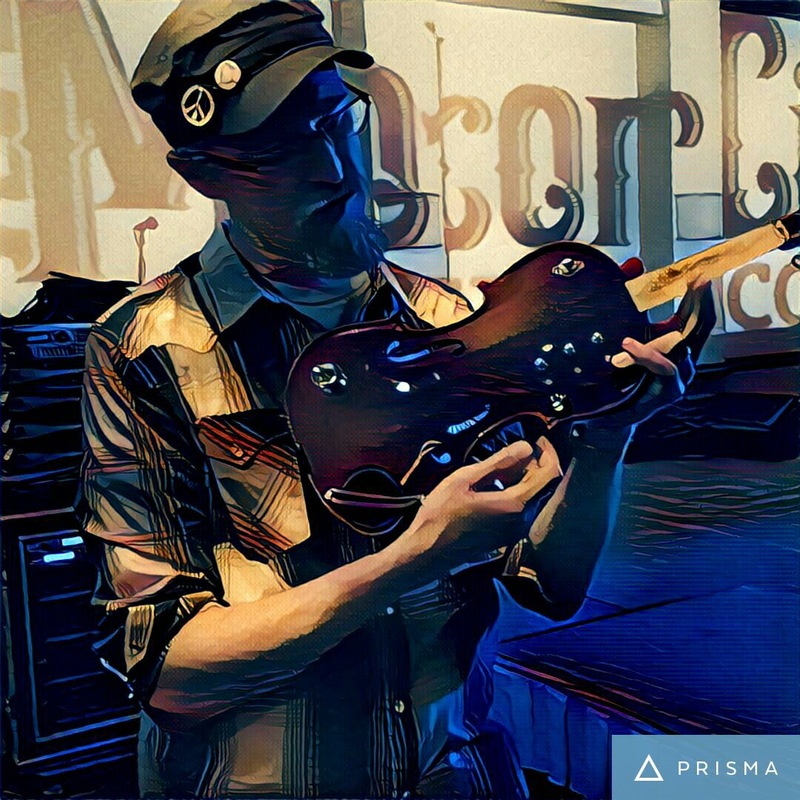 You might need headphones to hear the detail on the straight tremolo, but the throb becomes really pronounced at the end when I chain the two effects together. In the process of uploading that demo video, I stumbled across this guy’s build of the Single-Chip Space Invader synth from my most recent book. Oh, man, do I love that Star Wars lunchbox he used as a case! So rad! Any of this look rad? You can download a “jam pack” of complete projects drawn from both books. 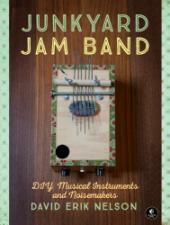 Click here now to get your free Junkyard Jam Pack PDF! 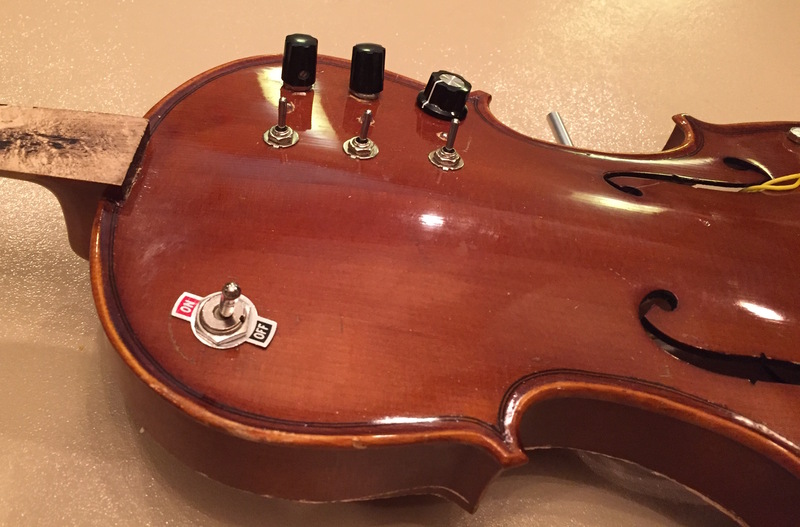 This is a fun little mechanical musical sequencer. Keep watching and then look around you! 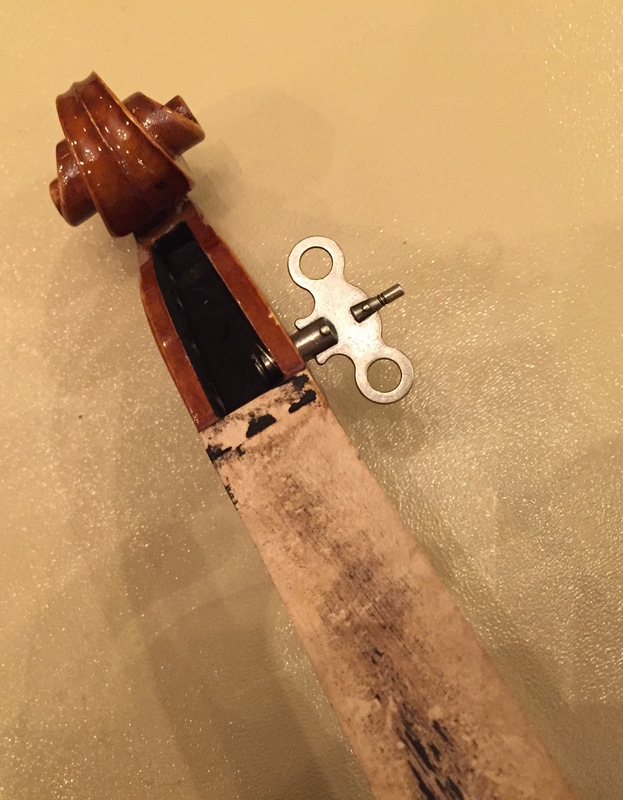 The “Non-Violins”—’cause it was a violin, but it ain’t no more! So what’s going here? Some of it is standard steampunk greebles (e.g., that faux wind-up key, the old vacuum tube being lit with a modern LED mounted behind it, some obtuse knob and mounting hardware choices), but the guts are a combination of totally legit early prototype circuits from my book (e.g., a four- step version of the Bleepbox Sequencer, of which only three of the steps can be pitch-controlled) and simple versions of a few others I hacked together on the spot (the voice is a stripped-down Single Chip Space Invader Synth driving a simplified Dirty-Cheap Amp). Why did I do this? ’cause Emmy Jackson asked me to. 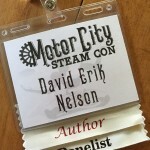 Emmy is a really swe ll guy, and did me huge solids at both Motor City Steam and Penguicon (where he both handled book sales for me and the other authors on hand, and offered a safe space for my son if he should lose track of himself or get freaked out). 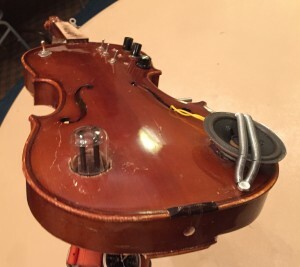 He showed up at Motor City Steam with four rejected violin bodies, on the condition that I rework at least one to fit in with his Dieselpunk aesthetic. I gladly gave it my damndest (another instrument from this same weekend, the Diddley Fiddle, is still in development—as is, it’s a fine lil diddley bow, but damned if I don’t want it to be at least a tad more electromechanically rad-as-hell).